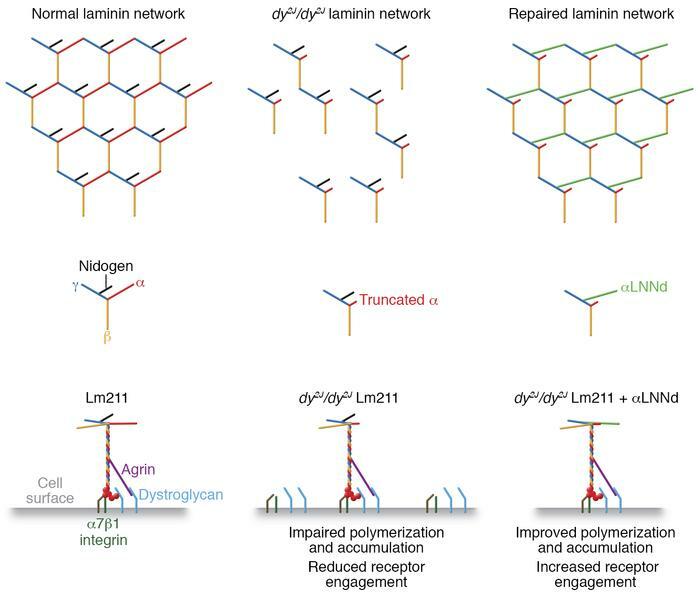 A designer chimeric polypeptide restores function of defective laminin. Lm211 is a heterotrimeric glycoprotein consisting of one α2-, one β1-, and one γ1-subunit that is an essential extracellular matrix component of the skeletal muscle fiber BM. WT Lm211 readily polymerizes and becomes integrated into the BM and serves to link the muscle fiber to the BM via receptor binding. Mutations in the gene encoding the laminin α2-subunit cause a congenital muscular dystrophy due to absent or defective Lm211. The mutant Lm211 present in dy2J/dy2J mice has a truncated laminin α2 that is unable to polymerize. The polymerization defect results in disruption of the BM, leading to loss of BM integrity and reduced muscle function. In this issue, McKee and colleagues developed a chimeric polypeptide (αLNNd) that contains the laminin N-terminal (LN) domain of the laminin α1-subunit and the G2-G3 domains of nidogen, which simultaneously rescued polymerization of mutant truncated laminin α2/Lm211 (right) and linked laminin to the collagen IV network (not depicted). αLNNd thereby restored muscle function in dy2J/dy2J mice.